Structural Engineer Inspections and Reports are commonly required when a property has evidence of past or ongoing structural movement – such as fracturing or distortion to walls, floors, roofs or internal finishes. Examples of building distortion might include bulging or leaning walls, sagging ceilings and roofs, or an overall “tilt” in one direction. Our structural engineer will try to determine – if possible by an initial visual inspection – whether this movement is longstanding and stable, or whether it is possibly ongoing and progressive. 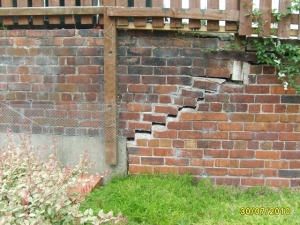 Sometimes it is not possible to reach a firm conclusion from a visual inspection and further investigations may be required, in which case the structural engineer will advise you of this (see below under “Site Investigations”). It is important to remember that such surveys are, in the first instance, visual inspections only and unless special arrangements have been made beforehand to do so, will not include comments on any areas of the property that are inaccessible or hidden from view.